So Bill Nye's gonna debate Ken Ham. That's weird, but whatever. But in what universe does the debate topic even make sense? To resolve: "Is creation a viable model of origins?" This is some full-on lawyer-grade mumblespeak so let's actually try to concretely define these terms. Creation: A supernatural process or instantaneous event by which natural things arise. Viable: Worth time and effort. Not immediately dismissible as wrong. Model: A set of scientific assumptions for understanding a process or pattern. Origins: Where natural things come from. Science has no ability to test supernatural things. Creation, by its own definition reliant upon supernatural things, isn't scientific. Debate topic makes no sense. The origins of the universe and the matter and energy within it are problematic for science to test because, by definition, the origins of space and time didn't happen in our observable space and time. Debate topic might make some sense if it was limited to these origins. For anything that is within the universe (the Earth, life on Earth, humans) there are viable scientific models for their origin. Creation doesn't provide a viable scientific model because, as already stated, creation isn't scientific. Debate topic makes no sense. In a universe in which supernatural things are capable of instantly or even gradually causing natural things to happen, assumptions about patterns or processes can't be made. If a supernatural thing can create a planet out of nowhere, then there can not be a universally applicable model for planet formation: some planets will have been supernaturally created out of nowhere, some won't. If a supernatural thing can slowly create a species, then there can not be a universally applicable model for species formation. Debate topic makes no sense. The Creation Museum is not pushing a general idea of Creation, it is pushing an idea in which no natural thing has existed for longer than 10,000 years (at most), that all natural things were created by a supernatural thing, and that all scientific claims which do not explicitly acknowledge this supernatural thing are a priori wrong. By the definitions of the Creation Museum, then its debate topic makes sense. But to anyone else, the YEC position has been nonviable for a century and a half, and the debate topic makes no sense. The Creation model of origins is viable philosophically. That's the best it gets, so philosophers should be debating that. 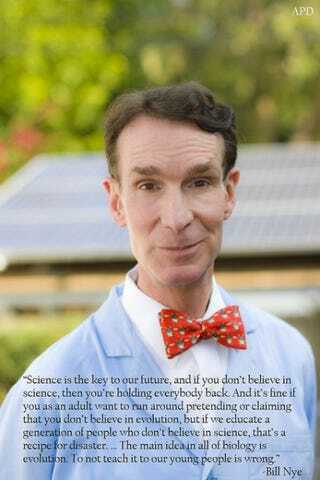 "To not teach [evolution] to our young people is wrong"
Bill Nye is purposely going to an institution which he says is doing wrong to publicly debate a topic which was intellectually abandoned in the 19th century. The only people who can positively spin that are the Creation Museum and their allies. When an evolution-supporting website pointed this out, Ken Ham used it as evidence for his point of view. Now that a well-respected personality like Bill Nye will be debating me on the origins topic, many of these atheists are worried. They just do not want people to hear such a debate! But why would they be so worried if it is so obvious that evolution is true? Liars: ignore them and they complain, give them attention and they lie. It's lose-lose for Bill and it's frankly disturbing for science education that a well-known science educator is giving these people any form of attention.